A great-value van gets a new look by a new manufacturer, Malibu Caravans. The Tango Escape is now the Malibu Caravans Escape. It’s still an Escape, and it’s still all about the escape. Until recently, this range of vans was built for Tango Caravans, a small outfit in Victoria’s Campbellfield, by Essential Caravans. But Tango’s Sarah Horter made the decision to switch manufacturing to Malibu Caravans. Having reviewed both the 18ft 6in and 18ft 8in Escapes before, I was keen to see what differences Malibu brought to the table. And so, with Australia in the boiling grip of a summer heatwave, I hitched up the latest 18ft 6in Escape – now known officially as the Malibu Escape rather than the Tango Escape – for a shakedown run. The most obvious difference between the earlier 18ft 8in model and the one reviewed here is in the cladding. Instead of ribbed aluminium sides, a smooth aluminium front and rear section, and a skirt of X-plate, the Malibu Escape has smooth composite aluminium cladding all-round over a meranti timber frame, black checkerplate lower protection, and a sharper, more angular, front profile. Finally, new decals and bold splashes of red – colour-matched to various accessories bolted to the van – set it apart from earlier Escape models. The layout of the van is much the same, it has to be said. It’s comprised of a front bedroom, a nearside kitchen and offside cafe-style dinette, and a full-width rear bathroom. Interior design mostly goes over my head but here are my two cents: personally, I preferred the decor of the earlier Escape – it was bright and almost beachy. By contrast, the decor of the Malibu Caravans Escape I looked at was a little darker. Having said that, choice of decor, etc., is a personal thing and can be customised when the van is being built. The interior of the Malibu Escape, I should make clear, is as nicely presented as you’d expect, and there are a number of welcome touches throughout. Each overhead locker door is fitted with piano hinges which, in my experience, is one of the stronger fixing methods. Given the compact dimensions of the van, the Escape feels quite spacious. Bench space in the kitchen is limited, yes, but the kitchen gets all the essentials, including a 184L three-way fridge with a microwave neatly recessed into the cabinetry above, and a filtered-water tap at the stainless steel sink. The dinette, meanwhile, is quite comfortable and the ‘Malibu’ stitching on the seat-backs is a classy touch. Each dinette lounge has snap-up footrests. In a locker above the dinette, a BMPRO Genius battery management system has been fitted, along with an Enerdrive solar charge controller – two 170W solar panels are fitted as standard, which given the van’s price point is very good indeed. The storage space below each seat can be accessed by hatches in the leg space, so you don’t necessarily have to remove the seat cushions and ply bases to access them. As with the earlier Tango Escape, the space beneath the forward seat is occupied by the water pump and hot water service, but the space below the rear seat is yours to fill. The front bed base lifts on gas struts to reveal a storage space that’s partially taken up by the tunnel boot; however, there’s enough room left over to store a portable solar panel, for example. The bed features wardrobes either side, along with ‘his and hers’ 12V and 240V points, so you can both charge your devices while you read them in bed. The bedroom also gets a 12V Sirocco fan and a flatscreen TV, which is mounted to a swivel arm. Neither the previous Escape nor this one come with a front window but I reckon one (and accompanying stoneguard) would be a worthwhile addition – it’s not gloomy, as such, but the more natural light the better. The bathroom is fitted out with the essential gear, including a separate shower on the nearside, an offside cassette toilet, and a central vanity with a ceramic washbasin. There’s even a 3.2kg washing machine. And a linen cupboard. The linen cupboard door, however, does not open all the way as it binds on the window above the toilet. While this doesn’t impede access, it seems like an unnecessary compromise. Otherwise, the bathroom gets good marks, especially in the space department. Again, considering the compact nature of this van, the manufacturer has done quite well. Plenty of other features have been included, from an air-conditioner to an under-bench slide-out pantry, and the LED strip lights above the overhead lockers adds a modern aesthetic. 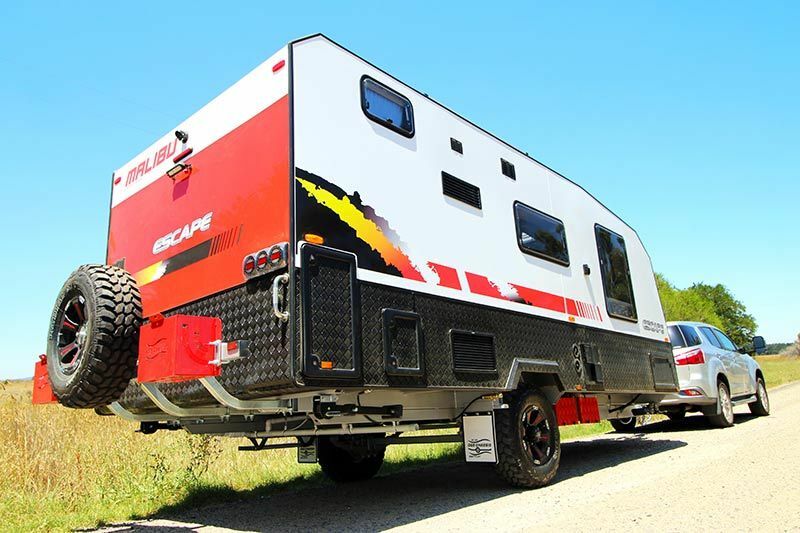 The Malibu Caravans Escape 18ft 6in rides on a 6in DuraGal chassis with all terrain tyres and leafspring suspension. As standard, it gets a reversing camera with in-car kit, a nearside picnic table, a roll-out awning with two under-awning lights, and front and rear LED floodlights. Other standard features include dual jerry can holders mounted either side of the spare wheel, with another two mounted to the front checkerplate storage box, which is fitted to the extended A-frame. The A-frame is home to two 9kg gas cylinders and a water tap. The Escape does well in terms of external storage, with the aforementioned front toolbox and gal-lined tunnel boot. Underneath, the van has two gal-protected 90L water tanks mounted forward of the axle. There is some PVC at the rear of the van, so it would pay to be mindful if travelling for extended periods on gravel tracks, etc. On the offside, two 105Ah deep-cycle batteries are secured inside a steel box that’s mounted to the main chassis rail, while the mains water inlet is mounted to the chassis up high and out of the way behind the wheel. I once described the Escape as one of the best-value caravans in Australia. Despite the change of manufacturer to Malibu Caravans, it still offers very good bang for your buck. I don’t consider it a ‘budget’ van, as it is fitted with most, if not all, items and comforts you’d find in a mid-range rig. And though it’s not the biggest, most feature-laden van on the road, it has plenty of kerb appeal. If you’re in the market for a new couple’s van, the Escape is worth a long, hard look.